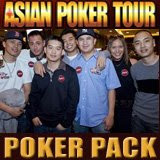 Leading poker staking website, www.chipmeup.pokernews.com, is pleased to announce a collaboration with The Asian Poker Tour’s (APT) Poker Pack at the 2009 Aussie Millions. The collaboration between leading poker staking website, ChipMeUp and The Asian Poker Tour’s (APT) Poker Pack will see the five world-class pros put up a piece of their play at the 2009 Aussie Millions for the public to invest in. The Asian Poker Tour is highly regarded as the biggest and most coveted tour in Asia with two successful stops under their belt in 2008 and an expanded tour in 2009. They have recently hand selected a team of talented individuals of Asian origin – dubbed The Poker Pack – who are ambassadors for the brand and share among themselves total live tournament winnings of over $22 Million. This premiere team is made up of Nam Le, JC Tran, David ‘Chino’ Rheem, Kwang Soo Lee, Steve Sung and Quinn Do. ChipMeUp is a website that allows players to buy/sell shares of themselves at some of the world’s biggest live and online poker events. Subscription is free with only a small fee charged for players wanting to put up a percentage of their play. Each Asian Poker Tour Poker Pack pro will put up 5 per cent of themselves in the 2009 Aussie Millions Main Event that will feature a guaranteed AUD2 Million first prize. The Poker Pack members will be donating all funds received from their 5% sale to the Shane Warne Foundation (http://www.tswf.com.au/). Unlike other charities, the Shane Warne Foundation does not directly work with the children; rather they distribute monies raised to established charities that provide essential help and services to children. The Foundation accepts submissions from Charities that are in dire need for facilities such as equipment, emergency transport; or services such as therapy, counseling, life saving operations, specialist care, housing – the list is endless. CHIPMEUP members, hktom and coughshamen who managed to snap up shares in The Poker Pack, have also joined the charity drive and will donate winnings from their purchased shares. To buy a piece of The Poker Pack, visit ChipMeUp, find the player you wish to stake and simply transfer the funds.